All transactions are safe and secure with a reliable history in online purchasing behind each of our associates. Buy the You're Nobody Till You're Talked About t-shirt to own Gossip Girl clothing and merchandise. 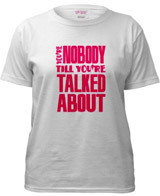 The front of this Gossip Girl tee displays pink text that reads, "You're nobody till you're talked about." This Gossip Girl tagline is a central theme of the teen show. For the perfect gift, pair it with the Gossip Girl logo tee displayed in this gallery. This bestselling piece of Gossip Girl clothing might just leave your friends wondering if you're the Gossip Girl. Simply remind them that you're not the type of person who likes to spread rumors and obsess over juicy, tantalizing gossip...right? In addition to the You're Nobody Till You're Talked About tee above, browse the Gossip Girl Clothing Gallery for more apparel like men's and women's clothes, kids shirts or hoodies.